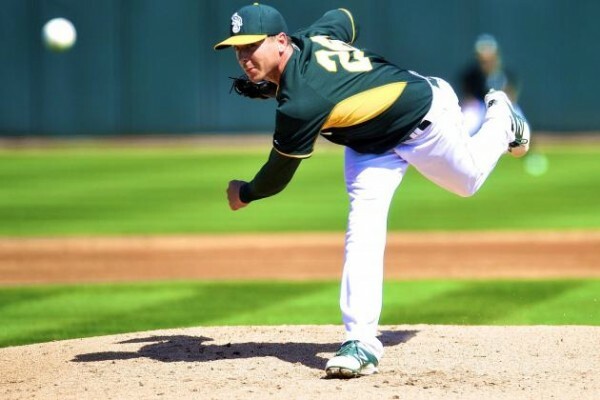 While the Oakland Athletics were obviously sellers in the days leading up to the trade deadline and the surprising Houston Astros buyers, the Scott Kazmir trade, which includes catcher Jacob Nottingham and right-handed pitcher Daniel Mengden going the opposite way caught many people off guard. The Astros, the A’s rivals in the AL West, are only one game behind the Los Angeles Angels in the division and are currently with the best record in the American League for teams not leading their division. Kazmir is now heading back to his hometown, where he played for Cypress Falls high school, hoping to take the Astros to the postseason for the first time since 2005, when they made it all the way to the World Series, getting swept there by the Chicago White Sox. The 31-year old is a three-time All-Star and was into his second season with the A’s, making the All-Star game last season. He has a 5-5 record through 18 starts but his ERA (2.38) is on pace to be the best (by far) of his career. His WHIP of 1.085 is also the best of his career, although he still has a few starts to make this season. Kazmir, making $13 million this season, is a free agent at the end of it. So what do the A’s, last in the AL West with a 44-53 record (11 games behind the Angels), get in return? Nottingham, a catcher a lot of teams were after, is 20. He’s 6’3, and in 168 professional games, he has hit .280 with an .816 OPS. Mengden, 22, has 101 strikeouts in 99⅓ professional innings.